What?? Sea dragons exist and they are having babies??? Posted August 04, 2016 15:12:44 The newest attractions at the Melbourne Aquarium are so adept at hiding themselves, even the most eagle-eyed visitor might have trouble spotting them. About 20 baby weedy sea dragons, also known as dragon fry, have made their public debut after a successful but complicated breeding program. As you can see on the pictures the sea dragons have a number of leaf-looking attachment to their bodies to make the better camouflaged. Because the sea dragons a re slow swimmers, and because they can’t grab onto vegetation on the sea floor, camouflage is their best protector against predators. In the report cited above there is a picture of the male sea dragon carrying the pink eggs under his tail. Similarly to sea horses, it’s the male that cares for the sea dragon eggs. The first time I saw sea dragons was at the Shedd Aquarium in Chicago where my daughter and I visited a sea horse and sea dragon special exhibit. It was like a treasure hunt just to be able to find the sea dragons in the water tanks; they were camouflaged among the seaweed in the tanks. I was impressed by this ability to be hidden, and I made several ceramic pieces inspired by sea dragons. The only surviving piece is a rectangular tile where I made seven oval reliefs into a wet sheet of clay. 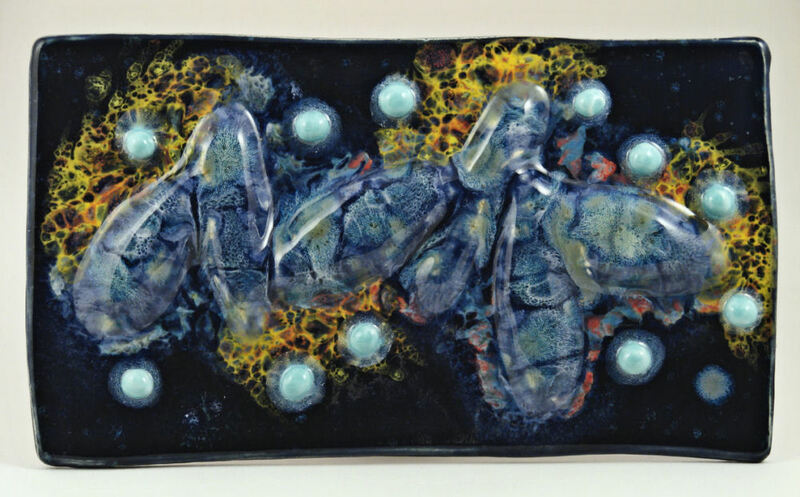 I glazed and glaze fired this piece several times. 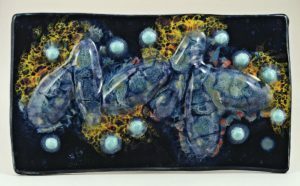 I then placed glazed ceramic pearls on the tile surface, and glaze fired it again. What resulted is a very complex surface colors, some of the glazes got mixed by the repeated firings, some glazes moved around and spread. The bright greenish-blue color of the pearls flowed to the base of the pearls forming a halo. It might be time to liven up the winter by making a few more sea dragon tiles, or even sculptures.